Pecans are charismatic and personable and have a way of charming their way into your heart—it really doesn’t take much to win you over. Just crack open a fresh pecan in the shell, pop it into your mouth, and you’ll soon taste a divinely delicate sweetness with distinct undertones of an earthy creaminess. Their flavor is reminiscent of weak coffee with a hint of sugar and a generous pouring of milk. As you pop another fresh pecan into your mouth, notice the texture is unlike any other nut and is best described as having an endearing subdued crunch. Because pecans are native to the American South, they frequently turn up as pecan pie on Southern dessert menus. This version has all the eye-appealing and flavorful attributes of its traditional counterpart with the added benefit of being egg-free and cholesterol-free. Taking the place of the eggs is a combination of tapioca flour and flaxseeds that give the pie its unique, creamy texture. Tapioca flour performs the double duty of thickening the filling as well as providing an inviting glaze. Create a love-at-first-glance dessert by taking the time to sort out beautiful pecan halves for the topping and then arranging them side-by-side in concentric rings. This is one of the many delicious recipes in Zel Allen’s The Nut Gourmet cookbook. 1. Preheat the oven to 350 degrees and have ready a large baking sheet. Bake the pie crust for 5 minutes and set it aside on the baking sheet to cool. 2. Place the unbroken pecan halves in a small bowl, and reserve them for the topping. Place the coarsely broken pecans in a non-stick skillet and toast them over high heat, stirring constantly, for about 1 to 2 minutes until the pecans become slightly fragrant. Watch carefully to avoid over-toasting or burning them. Pour the toasted pecans immediately into a dish to cool. When cool, spoon them into the bottom of the pie shell. 3. Melt the margarine over medium heat in a 2-quart saucepan. Add the corn syrup, brown sugar, and vanilla extract and bring to a full boil over medium heat, stirring frequently. Boil 5 minutes, then set aside to cool about 30 minutes. 4. Place the soymilk in a bowl and stir in the tapioca flour. Set it aside for 5 minutes to allow the tapioca to absorb some of the liquid. 5. Meanwhile, place the flaxseeds in a small electric coffee grinder or mini chopper-grinder and grind them to a fine meal. Add the flaxseeds and the tapioca soaked soymilk to the cooled corn syrup mixture. Stir to combine, and pour the mixture into the blender. Blend for 1 minute until smooth, then pour over the toasted pecans. 6. 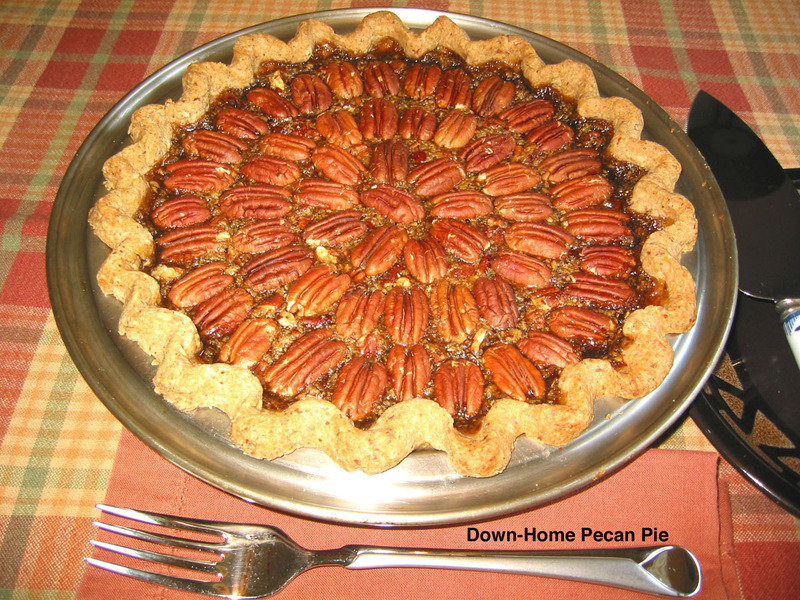 Top the pie with the reserved pecan halves, arranging them in concentric circles beginning on the outside. Bake for 40 minutes. Cool thoroughly, then chill in the refrigerator. The pie will firm after it is thoroughly chilled. Flaxseeds processed in the blender with water can serve as a thickener and binder in baked goods. Because of their viscous nature, flaxseeds ground with water tend to cling to the blender, if allowed to dry. To ease the cleanup, fill the blender with water as soon as you remove the flaxseed mixture and allow it to soak for a few minutes before washing it.